We end 2017 with a countdown of the 10 biggest stories of the year on Soccer Stadium Digest, as chosen by editors and partially based on page views. Today, #8: Louisville City FC makes the pitch for a new stadium. Louisville City FC appears to be well on its way to a new era. 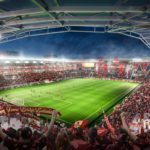 By devoting significant time to the push for a proposed new stadium and related development over the last several months, the club effectively spent much of 2017 laying the groundwork for its future. Since beginning USL play in 2015, Louisville City FC has staged its home matches at Louisville Slugger Field. Over its time at the facility—also home to baseball’s Louisville Bats (Class AAA; International League)—the club has had remarkable success on the attendance front, but its financial situation has always been believed to be more sustainable over the long run in a new stadium. The club made serious headway on a new stadium in 2016, and made even more strides in 2017. Land in Louisville’s Butchertown neighborhood was identified as the preferred site of a new stadium and related development. The stadium itself was estimated to cost $50 million, with an initial capacity of 10,000 and the ability to expand to 20,000 should Louisville ever make the move to MLS. Furthermore, the total project called for retail, a hotel, and offices to be built through private investment and potentially backed by tax increment financing (TIF). Politically, the biggest hurdle the proposed Louisville City FC stadium proposal cleared in 2017 was on the funding side. The club’s plan included a request for Louisville Metro Government to spend $30 million on the project. After considerable discussion that included delaying a previously scheduled vote, the Louisville Metro Council approved $30 million in bonding in its October decision. Of that $30 million, $25 million will be used for land acquisition, with the additional $5 million used as a contribution to brownfield remediation and public infrastructure. In that same meeting, the council passed all four measures relating to the stadium project, including one to apply for a TIF district, which will ultimately have to be approved by the Kentucky Economic Development Finance Authority. If everything goes forward as anticipated, the new Louisville City FC stadium would open for the 2020 USL season. With both a new stadium and development in the surrounding area, the project could attract plenty of attention if it does come to fruition, and could allow Louisville City FC to position itself for a big future.